The two major and three minor NERC interconnections, and the nine NERC Regional Reliability Councils. 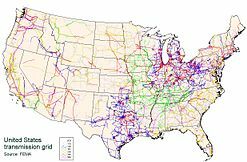 The electric power transmission grid of the contiguous United States consists of 120,000 miles (190,000 km) of lines operated by 500 companies. The electrical grid that powers mainland North America is divided into multiple regions. The Eastern Interconnection and the Western Interconnection are the largest. Three other regions include the Texas Interconnection, the Quebec Interconnection, and the Alaska Interconnection. Each region delivers 60 Hz electrical power. The regions are not directly connected or synchronized to each other, but there are some HVDC interconnections. In the United States and Canada, national standards specify that the nominal voltage supplied to the consumer should be 120 V and allow a range of 114 V to 126 V (RMS) (−5% to +5%). Historically 110 V, 115 V and 117 V have been used at different times and places in North America. Mains power is sometimes spoken of as 110 V; however, 120 V is the nominal voltage. In 2009, the Wall Street Journal reported that spies from China and Russia, as well as from other countries, "penetrated the U.S. electrical grid and left behind software programs that could be used to disrupt the system." According to U.S. officials, the spies didn't seek to damage the power grid; however they might be able to do so during a war or crisis. Most of the intrusions were detected by American intelligence agencies. The North American Electric Reliability Corporation (NERC) is a nonprofit corporation based in Atlanta, Georgia, and formed on March 28, 2006, as the successor to the North American Electric Reliability Council (also known as NERC). The original NERC was formed on June 1, 1968, by the electric utility industry to promote the reliability and adequacy of bulk power transmission in the electric utility systems of North America. NERC's mission states that it is to "ensure the reliability of the North American bulk power system." NERC oversees eight regional reliability entities and encompasses all of the interconnected power systems of the contiguous United States, Canada and a portion of Baja California in Mexico. NERC's major responsibilities include working with all stakeholders to develop standards for power system operation, monitoring and enforcing compliance with those standards, assessing resource adequacy, and providing educational and training resources as part of an accreditation program to ensure power system operators remain qualified and proficient. NERC also investigates and analyzes the causes of significant power system disturbances in order to help prevent future events. The Eastern Interconnection is one of the two major alternating-current (AC) electrical grids in North America. All of the electric utilities in the Eastern Interconnection are electrically tied together during normal system conditions and operate at a synchronized frequency operating at an average of 60 Hz. The Eastern Interconnection reaches from Central Canada eastward to the Atlantic coast (excluding Quebec), south to Florida, and back west to the foot of the Rockies (excluding most of Texas). Interconnections can be tied to each other via high-voltage direct current power transmission lines (DC ties), or with variable-frequency transformers (VFTs), which permit a controlled flow of energy while also functionally isolating the independent AC frequencies of each side. The Eastern Interconnection is tied to the Western Interconnection with six DC ties, to the Texas Interconnection with two DC ties, and to the Quebec Interconnection with four DC ties and a VFT. On October 17, 2009, the Tres Amigas SuperStation was announced to connect the Eastern, Western and Texas Interconnections via three 5 GW superconductor links. 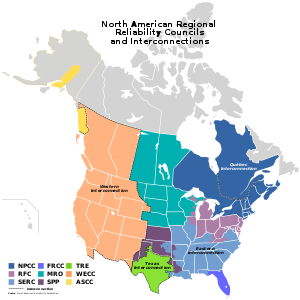 The Western Interconnection is the other major alternating current (AC) power grid in North America. All of the electric utilities in the Western Interconnection are electrically tied together during normal system conditions and operate at a synchronized frequency of 60 Hz. The Western Interconnection stretches from Western Canada south to Baja California in Mexico, reaching eastward over the Rockies to the Great Plains. Interconnections can be tied to each other via high-voltage direct current power transmission lines (DC ties) such as the north-south Pacific DC Intertie, or with variable-frequency transformers (VFTs), which permit a controlled flow of energy while also functionally isolating the independent AC frequencies of each side. There are six DC ties to the Eastern Interconnect in the US and one in Canada, and there are proposals to add four additional ties. It is not tied to the Alaska Interconnection. On October 13, 2009, the Tres Amigas SuperStation was announced to connect the Eastern, Western and Texas Interconnections via three 5 GW superconductor links. The Texas Interconnection is one of the three minor alternating current (AC) power grids in North America. All of the electric utilities in the Texas Interconnection are electrically tied together during normal system conditions and operate at a synchronized frequency operating at an average of 60 Hz. The Texas Interconnection covers most of the state of Texas. Interconnections can be tied to each other via high-voltage direct current power transmission lines (DC ties), or with variable-frequency transformers (VFTs), which permit a controlled flow of energy while also functionally isolating the independent AC frequencies of each side. The Texas Interconnection is tied to the Eastern Interconnection with two DC ties, and has a DC tie and a VFT to non-NERC systems in Mexico. There is one AC tie switch in Dayton, Texas that has been used only one time in its history (after Hurricane Ike). The Québec Interconnection is one of the three minor alternating-current (AC) electrical grids in North America. The Quebec Interconnection covers all of the Province of Quebec and operates at an average system frequency of 60 Hz. It connects 18 systems in the US and Canada to one electric utility company: Hydro-Québec. It is operated as an independent AC grid for physical reasons. Because of its unique status, it is often functionally considered part of the Eastern Interconnection. The Quebec Interconnection is tied to the Eastern Interconnection with four high-voltage direct current power transmission lines (DC ties), and with one variable-frequency transformers (VFTs) line, which isolate the unsynchronized AC frequencies of each side. The Alaska Interconnection is one of the three minor alternating-current (AC) electrical grids in North America. It is composed of two grids isolated from each other and from the rest of North American grids. ^ Borberly, A. and Kreider, J. F. (2001). Distributed Generation: The Power Paradigm for the New Millennium. CRC Press, Boca Raton, Florida. 400 pgs. ^ . (2001). Glover J. D., Sarma M. S., Overbye T. J. (2010) Power System and Analysis 5th Edition. Cengage Learning. Pg 10. ^ Gorman, Siobhan (2009-04-08). "Electricity Grid in U.S. Penetrated By Spies" (PDF). The Wall Street Journal. Retrieved 2018-05-02. ^ "Control Area Concepts and Obligations" (PDF). North American Electric Reliability Council. July 1992. Retrieved July 18, 2011. Today, in NERC, there are four major interconnected areas: the Eastern Interconnection, the Western Interconnection, the Texas Interconnection, and the Québec Interconnection.